After thirteen years in evangelism and five years of teaching evangelism at Dallas Seminary, Mike wrote, Evangelism; a Biblical Approach. This is not just another how-to-witness book on evangelism. It is a Bible study approach that examines what the New Testament says about evangelism. From a Biblical perspective, it answers such questions as, "What is evangelism?" and "Why evangelize?" Then, it addresses the message in evangelism, including discussions of sin, the gospel, repentance and faith. This section of the book contains a detailed explanation of Revelation 3:20, entitled, "Don't Ask Jesus to Come into Your Heart." The section on the principles of evangelism include studies on the gift of evangelism, as well as prayer, wisdom and boldness in evangelism. 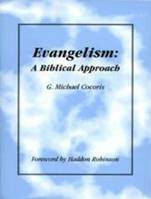 The final section of this 176 page book covers the practice of evangelism. Chapters on where to start and how to lead people to Christ are followed by how to deal with the three types of non-believers. The book closes with a chapter on Biblical follow-up. Evangelism; a Biblical Approach. is available for $12.95, plus shipping and handling.